The gallery in Paris where these were stored, was kept secret from the eyes of the public. Like a hidden vault, accessible only to a restricted elite, it contained spatially defined, visualized knowledge enshrining the entire power of the Kingdom. Interestingly enough, this is a first example of large-scale geo-spatial information storage and management. Because of their strategic function, engineers manufacturing raised relief models took great care in providing an exact representation of the settlements in relation to their surrounding landscape. This was extremely important for military engineers who would want to know whether or not a city could be targeted from a particular hill, in order to take the necessary protective measures. This is why despite its strictly utilitarian function, raised relief models of that historic period paid such minute attention to the landscape around cities. After Louis XIV, other relief models at a scale 1:600 were manufactured both for defensive engineering and for commemorative purposes. 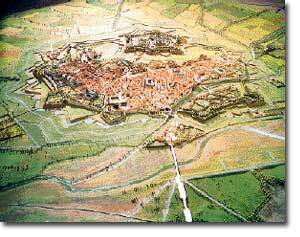 Three-century old scaled relief model of the city of Perpignan, France (year of manufacturing: 1686). Musee des plans-relief, Hotel des Invalides, Paris Relief models manufactured purely for defensive planning purposes fell into disuse at the end of the IX century because the bastioned fortifications proved to be incapable of withstanding the artillery deployed by the Prussian army during the 1870 war. Note: The Sun King and his advisors consulting 1:600 scale relief models in the “Galerie du Bord de l’Eau” at the Louvre in Paris; miniature by Nicolas van Blarenberghe [French, 1716-1794] decorating a tobacco box.